The existing market for reaching college students on campus requires advertiser deals with each individual college administration. These deals are usually expensive and fail to engage students. 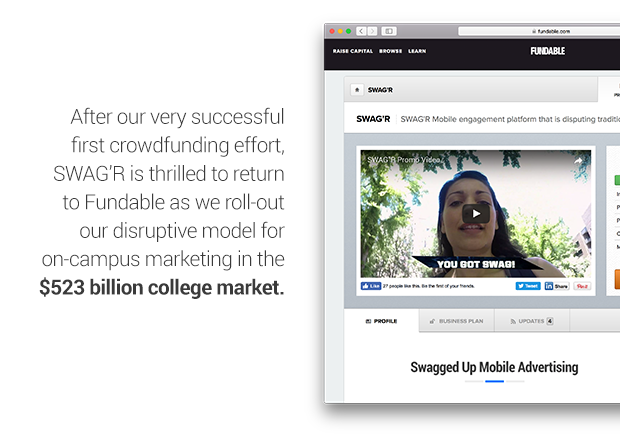 SWAG’R disrupts this model by creating digital real estate with engagement triggers across college campuses and offering advertisers access to it for a fraction of the cost. 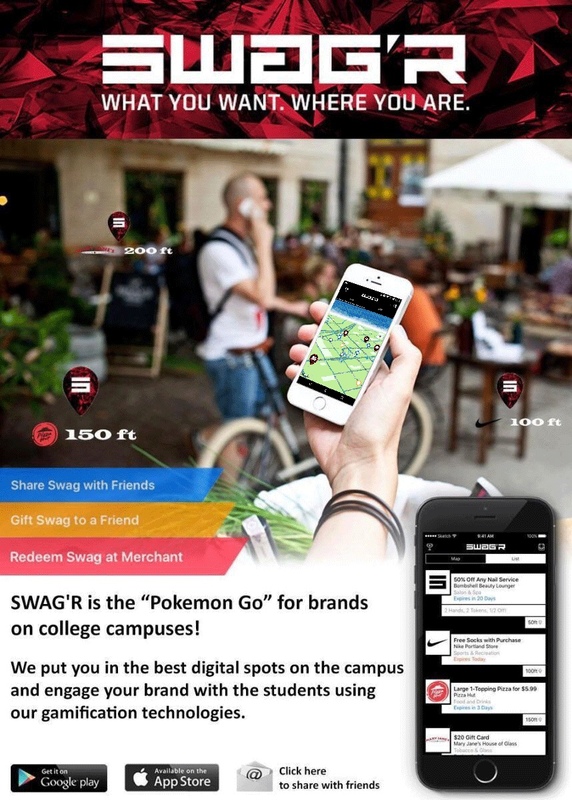 SWAG’R builds it’s digital real estate by giving students opt-in access to the best offers and exclusive deals for things they actually want, then delivering the offers in real time through the power of geolocation and gamification. Whether it’s snagging backstage passes to a concert, a BOGO deal for coffee, an offer for a chance to win a free trip, and practically everything else in between, SWAG’R makes it easy and fun to access awesome daily deals on products services of all kinds. The best part? SWAG’R rewards users for every single deal collected! If that doesn’t put a little swag in your step, we don’t know what will! When it comes to marketing to college students on campus, the current model is broken. If a major brand like Under Armour signs a multi-million dollar exclusive contract, for example with UCLA, other competing brands like Nike, Adidas, and others are pretty much out of luck – locked out of the UCLA campus. Not to mention the smaller and local merchants without the massive budgets. That’s where SWAG’R comes in. 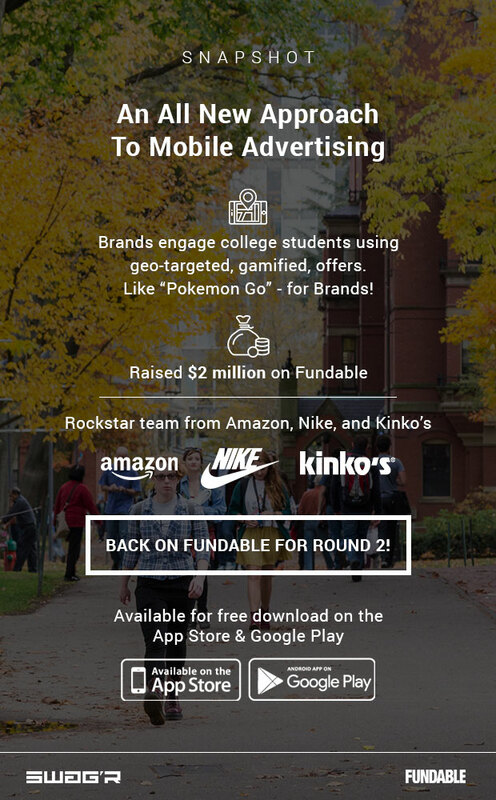 We’re rewriting the rules for college marketing by delivering targeted geo-fenced offers to students on campus in a fun, social, and rewarding way. The result? Valuable digital real estate that any brand can access for a fraction of the current cost - whether they’re a big name brand or a local mom-and-pop shop. SWAG’R has tapped into something truly unique, creating a win-win scenario for both advertisers and mobile social consumers. Consumers who gather in locations such as college campuses, sporting events, and trade shows demonstrate predictable behavior that is different than for individual consumers. Swag’r enables advertisers to leverage that predictable behavior while actively engaging them with their social networks on their smartphones. With SWAG’R, brands gain access to the large customer populations at the center of these concentrations, with the ability to deploy targeted offers at times of their choosing. Imagine finally having access to the digital real estate of a major event or on a college campus without having to pay $10K for restricted access governed by the rules of the college administration. Let’s face it. Most mobile ads are boring, disruptive, or irrelevant. With SWAG’R, engaging with advertising becomes a fun and competitive way to share, trade, challenge, and compete with others in your social network while receiving discounts, event deals, prizes, loyalty rewards, and more! There are no coupons to clip, no never-ending list of offers you don’t want. SWAG’R delivers only the deals you care about, when you want them. It’s that simple and that awesome! With SWAG’R, promotional offers from businesses are embedded into simple, fun, and rewarding activities that consumers engage with on their mobile phones in real time at their convenience. Open the SWAG’R map to find the swag points nearest you. As you get close to the pinpoints, targeted offers and promotions will be pushed to your smartphone from both name brand retailers and local businesses. If you like the deal, simply grab it and stash it in your swag bag. Move fast, though - many have limited availability! Once you’ve collected your swag, you can redeem it with the merchant, boost it to friends via social media, or even gift it. The more friends you get in the game, the more rewards you get. SWAG’R is designed to help brands meet their customers where they are through a feature-rich, flexible engagement marketing platform guaranteed to make a lasting impression on both consumers and the bottom line. SWAG’R uses cloud-based servers to place geographically targeted offers into consumer concentrations and to set and monitor sharing and gamification rules. Offers rules include price, date, time, quantity, expiration, and target profile. Our system allows easy one-touch roll-out of offers across campuses. Client reporting of performance results of marketing campaigns and offers. Client dashboard access coming soon. SWAG’R manages the redemption process automatically, allowing continuous personalization and optimization as consumers redeem. SWAG’R can also be used to collect market research by having students compete to answer questions. We’ve integrated gamification into our platform, incentivizing users to engage and compete with their social networks when redeeming offers. For example, the first user to grab and share a specific offer receives an additional 40% off as a bonus. Students can get bigger payoffs by collecting multiple offers. A SWAG’R leaderboard encourages ongoing competition and use. Our locator features ensures precise offer placement in walkable locations for students to collect offers. For our launch at ASU, we deployed offers in 85 offer hotspots throughout campus. SWAG’R allows users to share offers on social media, swap them with friends, or -- if they’re feeling generous -- give them away! Multi-campus promotions allow campuses to compete with each other. The SWAG’R team has made some incredible headway in just a short amount of time. We’ve successfully proven that SWAG’R is something that college students and brands believe in. We’re now gearing up to expand to even more colleges around the US, and 2017 is slated to be a watershed year for our company. The SWAG’R app is fully developed and available for free download in the Apple App Store and Google Play. 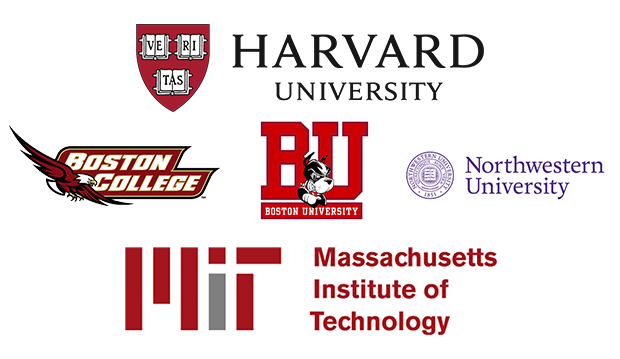 Boston University, Harvard, U Mass Amherst, Northeastern, U Mass Boston, U Mass Lowell, Boston College, Bridgewater State, Tufts, M.I.T., Bunker Hill Community College, Amherst College. Next 50 schools will come out of following regions; (business factors to decide) More than 1,000,000 additional students at the next 50 schools. 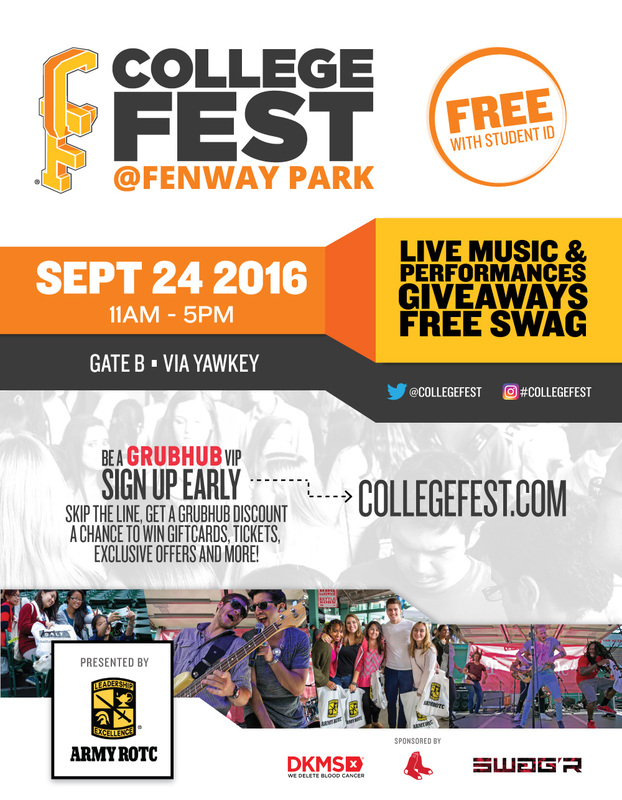 SWAG’R is also the official mobile app for CollegeFest at Fenway Park in Boston, the most heavily-attended back-to-college event in New England. We are also in active discussions with several other advertisers. Want to learn more about SWAG’R and their vision for the future? Make sure to request access to the Business Plan tab of the profile to find out how you can get involved! The SWAG’R management team is made up of proven business veterans dedicated to building a revenue-generation machine and making mobile advertising awesome. Greg is SWAG’R’s fearless leader and top dog. He is a serial entrepreneur and got his first taste of business leadership as the Co-Founder and VP of Sales of ShopperBox. He then founded a successful real estate brokerage firm called PontiFX, where he was CEO for 11 years. Greg then decided to switch gears and start SWAG’R. As Chairman and Chief Executive Officer, Greg guides the company and works to maintain its overall vision and passion. Rob is a proven veteran within the college market realm. He was responsible for the Kinko’s College Campus national launch, working with an annual budget of $40 million. This launch went down as one of the best college product launch to date. As COO, Rob is dedicated to operating the current fantastic opportunities in the college vertical, and in the future finding and building additional markets for SWAG’R. Marcia is all about operating budgets and revenue. She was the Corporate Treasure for a little company called Nike. She work beside Phil Knight for over 25 years and managed corporate budgets in the 100mil plus. Larry Large, Principal, L.D. Large Consulting, former President, Oregon Alliance of Independent Colleges & Universities; Interim President & CEO, Willamette University, Salem, OR; President Emeritus, Oglethorpe University, Atlanta, GA.
Hellmut Adolphs – Co-founder, Intellei.com, Washington DC; co-founder, Contaptiv Mobile (acquired by Millennial Media).